“What do you want to be for Halloween?” I asked. 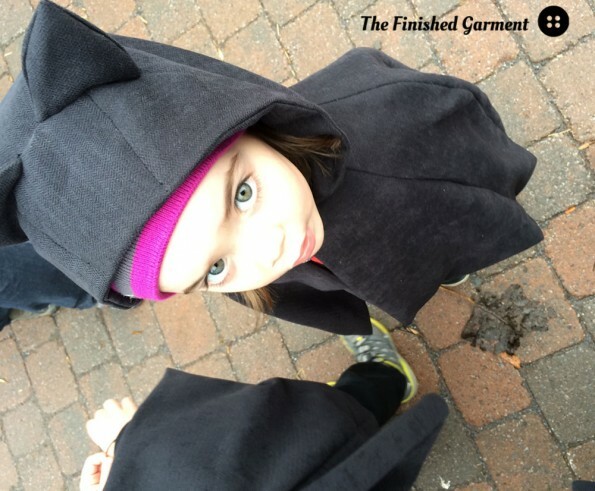 “I want to be a fruit bat”, announced my three-year-old, “a baby fruit bat”. “Yes, yes! 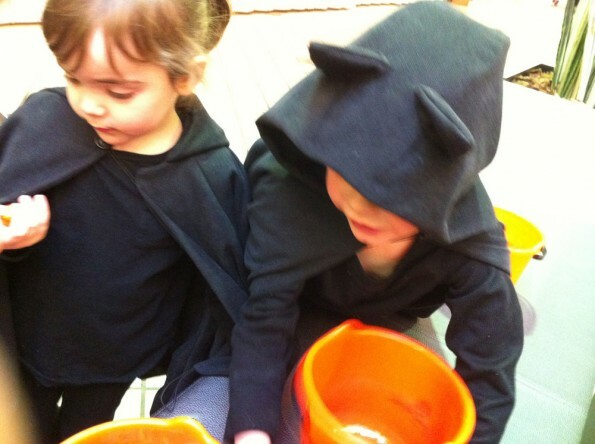 I want to be a fruit bat too!” kids No 1 and 2 agreed. Umm, ok then. My kids had been waffling over Halloween costumes, and nothing was really getting them excited about dressing up. Until this. So fruit bats. Hmmm. 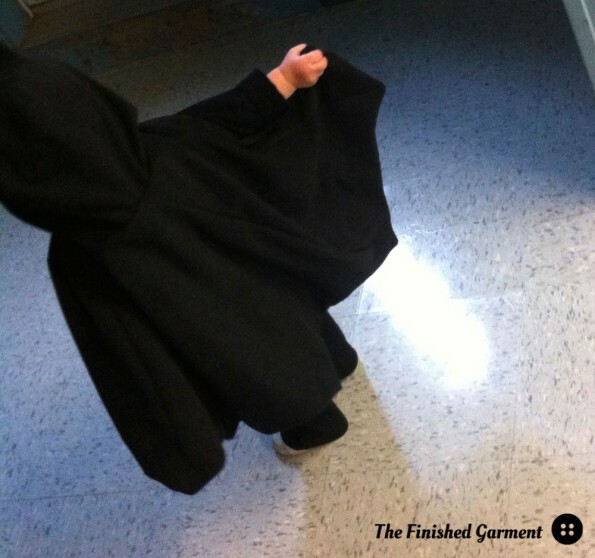 I decided to start with the Red Riding Hood pattern from the book Oliver + S Little Things to Sew . It is sooooo cute. Ack! I’ve been waiting for a good excuse to sew it. So off I headed to the fabric store, three-year-old in tow. 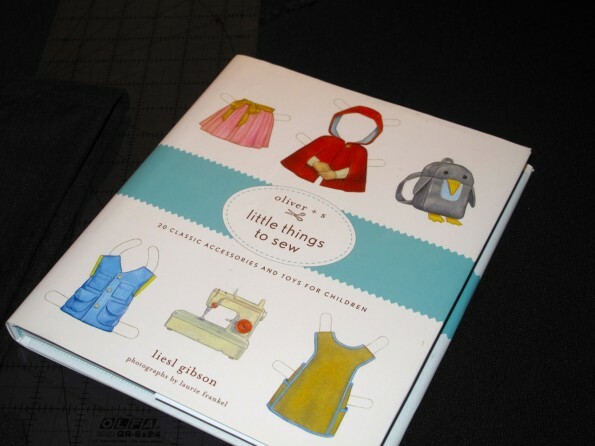 Oliver + S, Little Things to Sew. There is the Red Riding Hood on the cover. I cut the bottom in a scalloped pattern. I was hoping for a black faux suede, but there was only grey or brown available. In response I got a “no” that was part determined, part horrified and the look that I will one day get when I have to pick her up from high school. Sooo embarrassing, mum! So we tried another store, this time with all the kids in tow. “Would you like to be a shiny bat?” I said, showing off the faux leather. Oh, the horrified looks! I managed to find a faux suede/velvet with a herringbone pattern that met with approval. I was worried it would look a bit odd, but it was great. 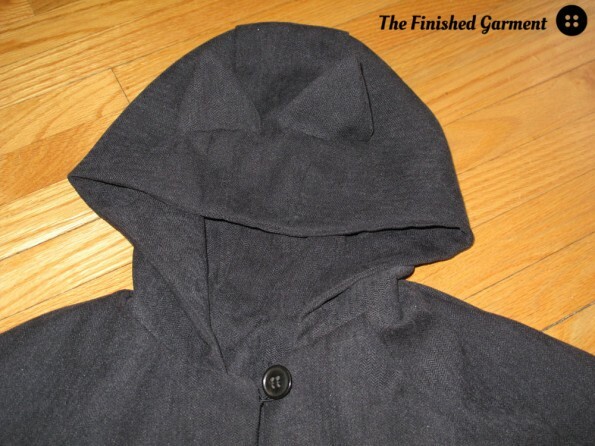 It was incredibly easy to sew with, and no black fluff everywhere! A first for fuzzy Halloween costumes! This pattern is so easy! And fast! Of course I had to make it four times, so fast is a relative concept. But if you are lucky enough to only have to make one, you will be pleasantly surprised. 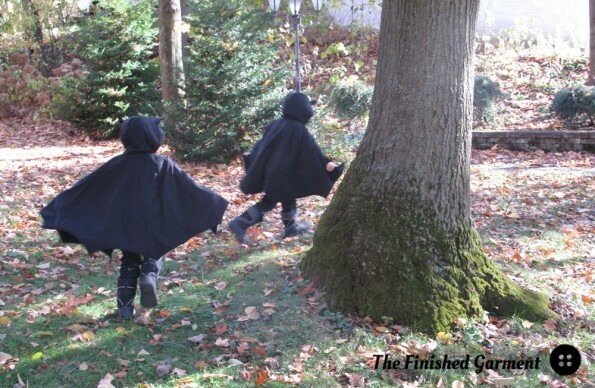 Four bat costumes using the Oliver + S Red Riding Hood pattern from Little Things to Sew. 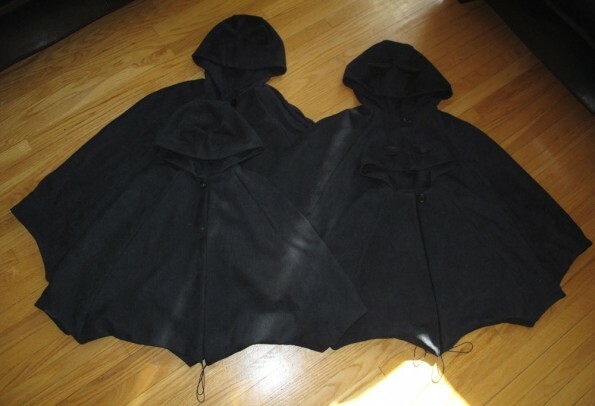 I skipped the arm openings, lengthened the capes by about two inches, cut the bottoms of the cape in a scalloped bat-wing pattern and hand sewed on ears. I used fine elastic for the button loops, which I thought would be less choke-y with a lot of bat-like swooping. I also added elastic loops at the end of the wings to make it easier to swoop without having to grab onto the wing tips. 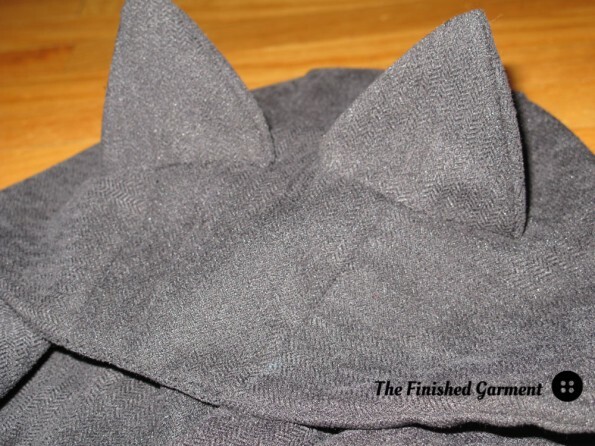 I hand sewed on some pointy ears. I used elastic for the button loop. The pattern comes in medium and large, so I graded a smaller size for my smallest. 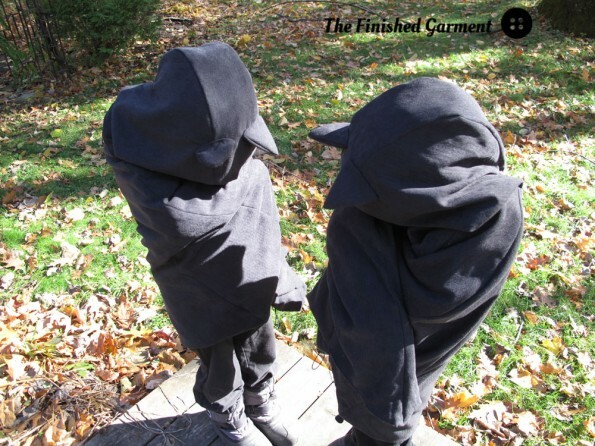 I found the pattern fit large, perfect for bats, but maybe I would go down a size for each kid, if it were for real life clothing. A tiny one-year-old baby bat. The cape is a bit big, but good for bats. 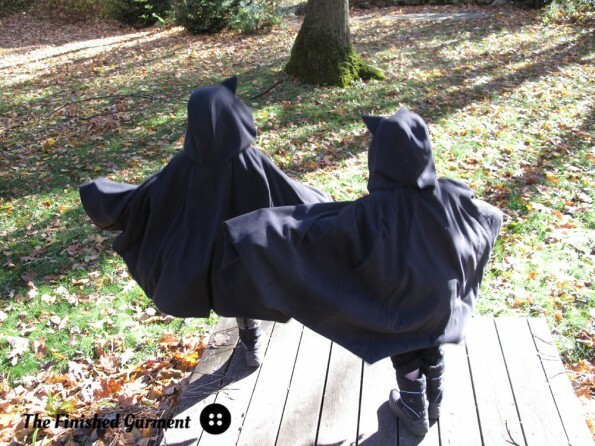 The capes got a lot of use, and we even took the kids to the bat exhibit at the zoo so they could say hello to the real fruit bats, dressed as bats. Fun! Check out the wings on that bat! Then my husband asked where his bat cape was. Doh! And then I got the flu. So next, year I have a huge head start on his half-made bat costume (ahem). Still, Halloween was a blast, and then we all got the flu. 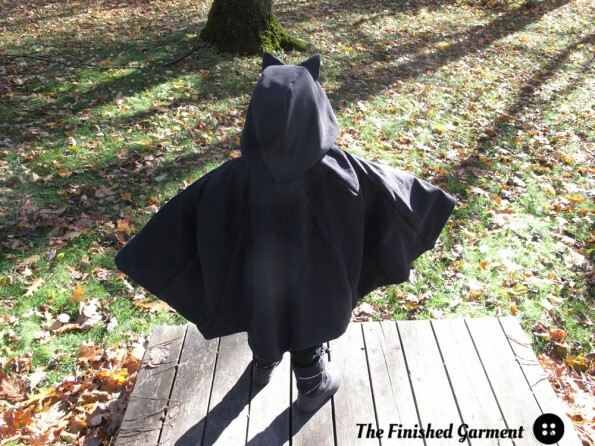 But that just meant that there was one more day of swooping bats today (though only two bats were willing to swoop) so that mummy could blog her sewing. Wings wrapped around the bats. 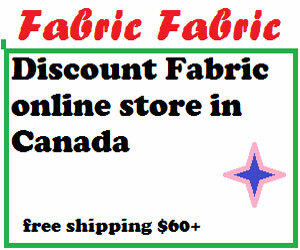 Fabric: Faux suede with a herringbone pattern. Some sort of synthetic. 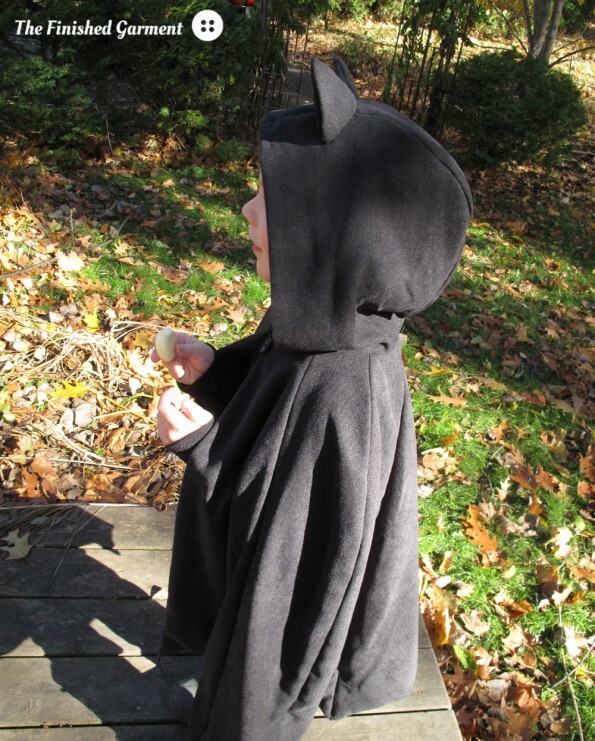 Modifications: I added bat ears, elastic loops at the wrists, used elastic for the button loop, and cut the bottom of the cape in a scalloped pattern. 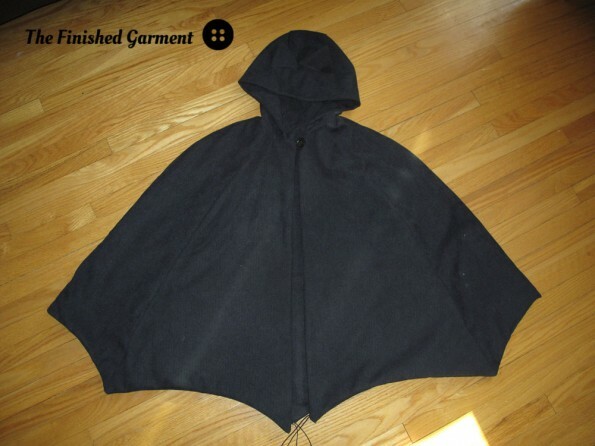 I lengthened the capes by about two inches. 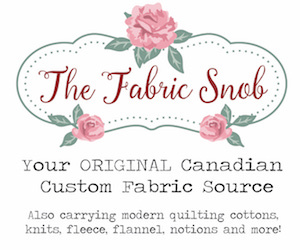 I graded a small size for my smallest, since the pattern only comes in medium and large. Results: Great. I would recommend this pattern and hope to make it as real clothing. Merci! C’est vraiment très gentil. What a great idea. Your fruit bats look darling. 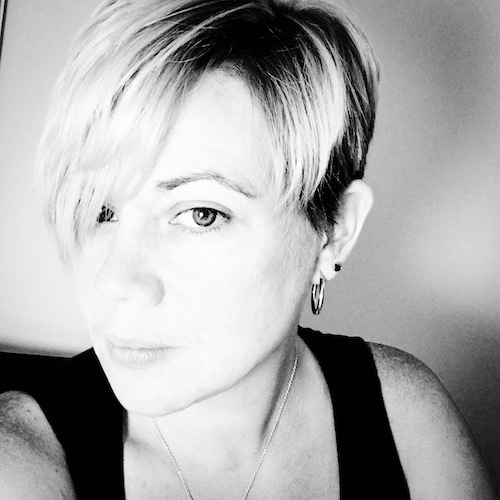 Dorienne Fairbanks recently posted…Two post in one day?